I like to read Clive Cussler adventure novels. These easy-to-read thrillers are all about underwater adventure and feature handsome heroes, beautiful babes, Communist plots and ALWAYS some kind of forgotten treasure. Inevitably, one of Clive’s heroes will get himself into some sort of deep-sea diving debacle, and as our hero fights off the villains and kicks his way back to the surface, he has to stop every once in a while to decompress, let out some air, before making his way further towards the surface… otherwise his head will explode. Well, not precisely, but you get the picture. You’ve held your breath before, whether it be underwater or just going through a tunnel along the highway. You have to sort of seep out a little bit of air at a time to keep your vision from going fuzzy at the edges right? And if you let out too much, too early, you start to get that panicked, “I HAVE TO BREATH IN NOW!” feeling and you push on the gas pedal and speed a little more to get out of that tunnel and into the sunshine and you take this gasping breath that feels like Heaven. Keeping Bullet a secret is kind of like holding your breath, and each person I get to tell about him/her is like a decompression stop, and if I don’t tell somebody like, once a week I feel like my head is going to explode. We told our parents about Bullet last weekend. 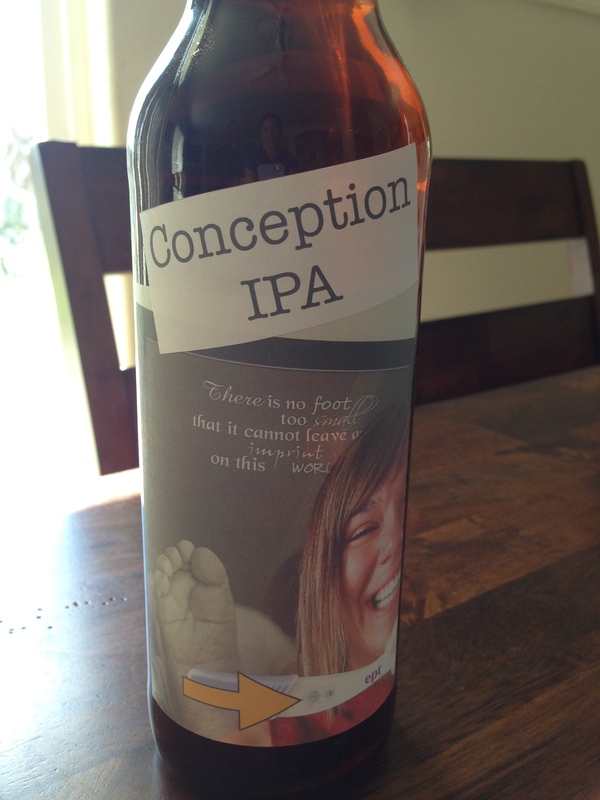 Presenting each family member with a bottle of “Conception IPA”, we relished the hugs, cherished the happy tears, wallowed in the joy, and let out this huge sigh of relief. But it might have been too much, too early. I want to tell everybody I know. I’m looking for any opportunity to “let it slip”. I’m dying for an accidental mention. I’m pooching out my 6-to-7 week belly in hopes that somebody will get suspicious. When you have good news, it’s hard to keep it a secret. You don’t want to let it seep out bit by bit. You want to exhale it at the top of your lungs, to hell with the consequences. Of course we have to tell certain people in the next few weeks. One of my best friends gets married a week from today. There’s no way I’m getting away with being empty-handed when it comes time to champagne toast my dearest college bestie as she makes the transition to Wife-dome. There are certain people I feel like just deserve to know. I called Doctor M to give her the big news before I even made it up to Yakima to tell the Hubs. So then it brings up this whole other question about WHY we choose to keep things like this a secret for so long? Most of my closest friends who have had children told me almost as soon as they knew. They went on to have healthy full-term babies, no “told too soon” jinx. The news is just too delicious not to share. I’ve spent too much time in the deepest depths and I feel like I deserve a giant exhalation. I am tired of holding my breath. There’s all this fresh, hopeful air to breath, and I am taking deep, long breaths. It’s a few days past Father’s Day, but I have had some things on my heart for the past several days related to Fatherhood, so I will keep it brief as well as belated. Seeing my husband become a father was one of the most unsettling things I’ve experienced in my 30 years (THIRTY I tell you!). Here you think you know somebody. You think you love somebody as much as you possibly can. And then you see your husband fall in love with your baby girl and life, love, everything just gets better. The Hubs and I have experienced a range of emotions in the eleven months since Hudson was born and since Hudson died, many of which we never want to experience again… but one thing I know we both want to experience again is that parenthood love. It’s worth it, people. Maybe I would never have had my heart broken, but I wouldn’t trade those 3 days with Hudson for a lifetime without her ever existing, because without Hudson I would never have met the ‘Daddy Hubs’ that I’m in love with today. There is this struggle as a parent of a dead baby, this yucky state of being that you are in without your baby still alive to parent. You don’t know how to answer questions about how many kids you have. You don’t know, no matter how many times people assure you otherwise, whether you still count as a Mom, as a Dad. You don’t know if you really want Mother’s Day, Father’s Day acknowledged. But I’ll tell you one thing. My husband is, was, and will be the best Dad ever. And I’ll fall in love with him all over again when Baby Dub Dos is born. I’ve long thought about how my writing would change once the Hubs and I were knocked up with baby number two. Will my less-desperate nature carry through in the tone of my writing and the subjects I reflect on? I also have cherished the writing I did before Hudson was born and died, as it captures some of her personality as it developed over the 9 months I carried her, and it captures the happiness the Hubs and I experienced as we got to know our daughter. So I knew that when I got pregnant again, the writing couldn’t stop. I just wouldn’t publish it right away. If you’re reading this today, you are reading something that was written weeks ago, and you get to catch up with the development of Baby Dub Dos, or as the Hubs and I have newly nicknamed him/her: Bullet. There were desperate days in the last 11 months… and on those desperate, low days, I would comfort myself with the thought of that day when I would take a pregnancy test and I would see a positive result and I would know that we were on the way to growing our family. I loved imagining the happiness. It brought me through. The real deal did not disappoint. 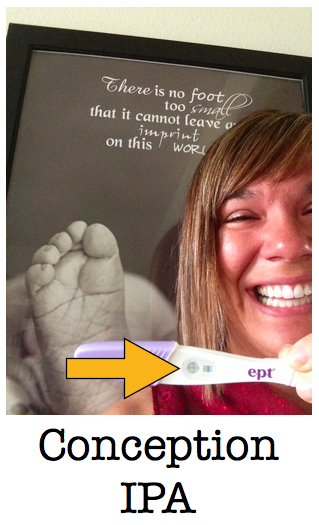 This might sound new-age-y and weird, but I knew I was pregnant. I laid in bed last Sunday night and I couldn’t sleep and I was confident that it was because we had accomplished our mission. I was determined not to test early, not to get too excited, but I did make sure that I had a two-pack of EPTs in the house for the day that would inevitably arrive when I could find out for sure that my intuition was correct. On June 13, I went and got my hair cut… like 6 inches cut off. I told my stylist, “There’s this weird superstitious part of me that is thinking, the last time I got pregnant I had short hair…” a statement which got a few laughs because it is truly ridiculous. And this day, I knew it was true. I forced myself to keep my eyes off the test for at least one minute (it required two), and then I just happened to glance and it was a plus sign. This time I did not drop a single eff bomb. I laughed and I cried and it was almost as awesome as I’d imagined it. The only thing that would have made it more awesome was if the Hubs had been there to laugh and cry with me. We’ve been talking about how we would break the news to our family and friends when Baby Dub Dos aka Bullet made their first appearance. It was determined that our homebrew hobby would be the vehicle for the news, and we would present people with bottles of Conception IPA. So, I made an impromptu label, slapped it on a bottle of our latest batch, and headed up to Yakima to break the news to the Big Bear. That part was just as awesome as I’d imagined it, too. And as predicted, This changes everything… again. After months of anticipation, the Dubs are pleased to announce the release of their latest batch of “homebrew”… Conception IPA! Enjoy the heady aromas of long-awaited good news. Savor the flavor of a mission accomplished… most likely in a trailer park. Hudson was born 11 months ago. Our daughter would have been 11 months old today. When I was pregnant with Hudson, about 6 weeks before she was due, in fact, I had the Hubs install the car seat in The White Stallion… just in case. You see, I was informed that the only things you NEED when you have a baby are diapers and a car seat… because you can’t take her home without one. So for the weeks leading up to July 11, I drove about with a car seat installed, ready for action should I go into labor early. And I would drive around with that car seat, and I would actually look in the rear view mirror and picture our baby girl in that car seat, and I couldn’t even fathom what it would be like with a baby that we made riding in it. Today I drove from Yakima to Walla Walla, pretty early in the morning, and I looked in the rear view mirror to check for pursuing cops as I sped along the highway and was hit with a sense of nostalgia for those six weeks that I drove around with the empty car seat. Then it struck me that today is the 11th. And of course there were tears. That empty car seat remained in my car for about a month after Hudson died. I just didn’t have the heart to take it out right away. In the weeks following our baby girl’s death, I would drive around in my car and look in the rear view mirror and imagine what our beautiful red head would be up to back there. And today, the back seat is empty. No empty car seat, but something about the rear view mirror check today had me thinking about what it would be like to have our 11-month old beauty with us today. She would have been so precocious, so spunky, so challenging but so fun. For the most part I was able to distract myself about today’s significance. I’m reading a book right now with a line that stands out “…I will remain too busy to be sad.” Mission accomplished on this particular 11th. But today, I didn’t remain too busy to write about the 11th day that would have been the 11th month, and I didn’t remain too busy to pine for what might have been in an alternate universe with that car seat full of precious red-headed bright eyed fun that was and is our daughter Hudson Ruth. Wherever that universe is, wherever our car seat is not empty, I want to go to there.